A work ascribed to Nehemiah, but bearing in some canons the title Esdras II. or Esdras III., having been attributed to Ezra on the ground that Nehemiah's self-assertion deserved some punishment (Sanh. 93b), or because, having ordinarily been written on the same scroll with the Book of Ezra, it came to be regarded as an appendix to it. The book consists ostensibly (i. 1) of the memoirs of Nehemiah, compiled, or at any rate completed, toward the close of his life, since he alludes to a second visit to Jerusalem "at the end of days" (xiii. 6, A. V. margin), which must mean a long time after the first. In xiii. 28 he speaks of a grandson (comp. xii. 10, 11) of the high priest Eliashib as being of mature years; whence it appears that the latest event mentioned in the book, the high-priesthood of Jaddua, contemporary of Alexander the Great (xii. 11, 22), may have fallen within Nehemiah's time. The redaction of his memoirs occurred probably later than 360 B.C., but how much later can not easily be determined. The first person is employed in ch. i.-vii. 5, xii. 31-42, xiii. 6 et seq. Sometimes, however, Nehemiah prefers to speak in the name of the community (ii. 19, iii. 33-38, x. ), and in some places he himself is spoken of in the third person, either with the title "tirshatha" (viii. 9, x. 2) or "peḥah" (xii. 26, claimed by him in v. 14; A. V. "governor"), or without title (xii. 47). The style of these last passages implies somewhat that Nehemiah is not the writer, especially that of the third and fourth: "in the days of Nehemiah the governor, and of Ezra"; "in the days of Zerubbabel, and in the days of Nehemiah." The portions of the book in which the first person is used are marked by repeated prayers for recognition of the author's services, and imprecations on his enemies (iii. 36, 67; v. 19; vi. 13; xiii. 14, 22, 29, 31), which may be taken as characteristic of an individual's style; and indeed the identity of the traits of character which are manifested by the writer of the opening and closing chapters can not escape notice. Moreover, the author's enemies, Sanballat and Tobiah, figure in both parts. (1) Ch. iii. 1-32, a list of persons who helped to rebuild the walls of Jerusalem. This document agrees with ch. xii. in exhibiting remarkable acquaintance with the topography of Jerusalem; and it also gives some curious details about the persons who took part in the work, some of whose names figure in other contexts. It is, however, observable that Eliashib is said to have been high priest at the time of Nehemiah's first visit; and the same is suggested by xiii. 7, whereas in Ezra x. 6 it is suggested that Eliashib's grandson (Neh. xii. 11, 12) was in office thirteen years before Nehemiah came. If the list of high priests in ch. xii. 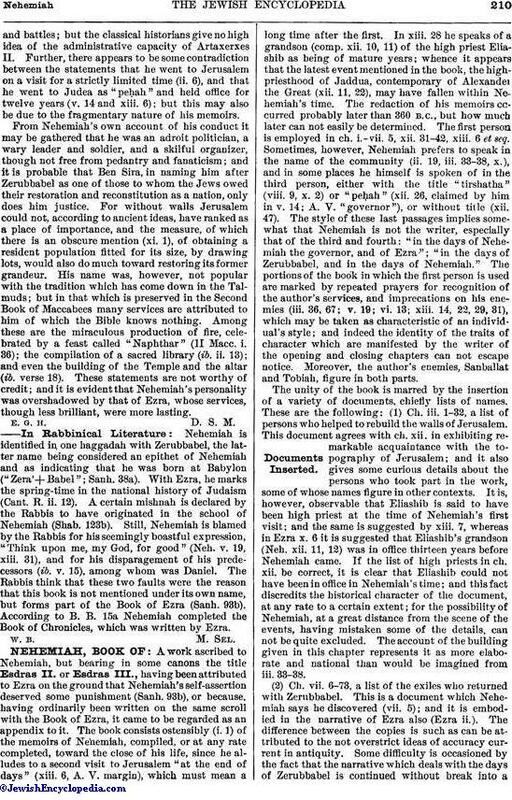 be correct, it is clear that Eliashib could not have been in office in Nehemiah's time; and this fact discredits the historical character of the document, at any rate to a certain extent; for the possibility of Nehemiah, at a great distance from the scene of the events, having mistaken some of the details, can not be quite excluded. The account of the building given in this chapter represents it as more elaborate and national than would be imagined from iii. 33-38. (2) Ch. vii. 6-73, a list of the exiles who returned with Zerubbabel. This is a document which Nehemiah says he discovered (vii. 5); and it is embodied in the narrative of Ezra also (Ezra ii.). The difference between the copies is such as can be attributed to the not overstrict ideas of accuracy current in antiquity. Some difficulty is occasioned by the fact that the narrative which deals with the days of Zerubbabel is continued without break into ascene which ostensibly took place in Nehemiah's own time; in other words, though the document is introduced as extraneous, it is not clear at what point it ends. Indeed, the purpose for which Nehemiah says he gathered the people, namely, to discover their genealogies (vii. 5), does not appear to have been realized, but instead the reader is taken into a scene at which the Law is publicly read by Ezra. Here again resort may be had to the hypothesis of carelessness on the author's part, or to that of compilation by an unscientific collector. (3) If the Septuagint be believed, ch. ix. contains a discourse delivered by Ezra. (4) Ch. x., containing a solemn league and covenant, bearing eighty-four signatures of persons who undertook to observe the Law of Moses and discharge certain duties. The number of signatories is evidently a multiple of the sacred numbers 7 and 12, and the list is headed by Nehemiah himself. Of the signatories some are persons about whom something definite is learnt in either Ezra or Nehemiah (e.g., Sherebiah, Ezra viii. 18; Hanan, Neh. xiii. 13; Kelita, Ezra x. 23), but those called "the heads of the people" appear all to be families, their names occurring to a great extent in the same order as that in which they occur in the list of ch. vii. This mixture of family names with names of individuals excites suspicion; but the unhistorical character of this document, if proved, would greatly mar the credit of the whole book. The framing of such a document at a time of religious revival and excitement has no a priori improbability. (5) Ch. xi. contains a list of persons who drew lots to reside at Jerusalem, with notices of the assignment of offices and of the residences of officials. This document agrees very closely in places with one embodied in I Chron. ix. ; indeed, both would appear to be adaptations of a register originally found in a "book of the kings of Israel and Judah" (ib. verse 1). It might seem as if the use of the word "king's" in Neh. xi. 23, 24, having been taken over from the older document, had given rise to the charge of which Nehemiah complains in vi. 6, where his enemies accuse him of making himself king; and indeed the arbitrary character of some of his measures (xiii. 25) would in part justify such a charge. If one may judge by the analogy of Mohammedan states, there would be nothing unusual in a provincial governor taking that title. The purpose of the register must have been seriously misunderstood by either Nehemiah or the Chronicler; but it may be inferred with certainty, from the occurrence of the same document in such different forms in the two books, that the compiler of Nehemiah is not identical with the Chronicler. (6) Ch. xii. 1-26 gives a list of priests and Levites who returned with Zerubbabel, carried down, very imperfectly, to Nehemiah's time, or perhaps later. The "book of the chronicles" (verse 23) is cited for parts of it; but this document covers some of the same ground as the last, and it might seem as if both were rough drafts, never finally worked up. It is of course open to the critic to regard the whole work as compiled by Nehemiah, who, where his memory or knowledge failed him, may have inserted these documents, or have ordered his secretaries to insert accounts of scenes. Indeed, the expression "and in all this" (xiii. 6), which reintroduces the personal narrative, implies that the author had before him some matter which he had not himself described.It is more usual to suppose that Nehemiah's memoirs were utilized by another writer, who did not take the trouble to alter the first person where it occurred; such a supposition involves no impossibility, provided the compiler be not identified with the compiler of Ezra or the compiler of the Chronicles; for the utilization by these authors of documents also incorporated in Nehemiah involves improbabilities calculated to outweigh any arguments that can be urged on the other side. Ben Sira (Sirach [Ecclus.] xlix. 13), in describing Nehemiah's work, evidently refers to the account found in Neh. i.-vii. 1; from the short space that he devotes to each hero no inference can be drawn with regard to the existence of the whole work in his time. 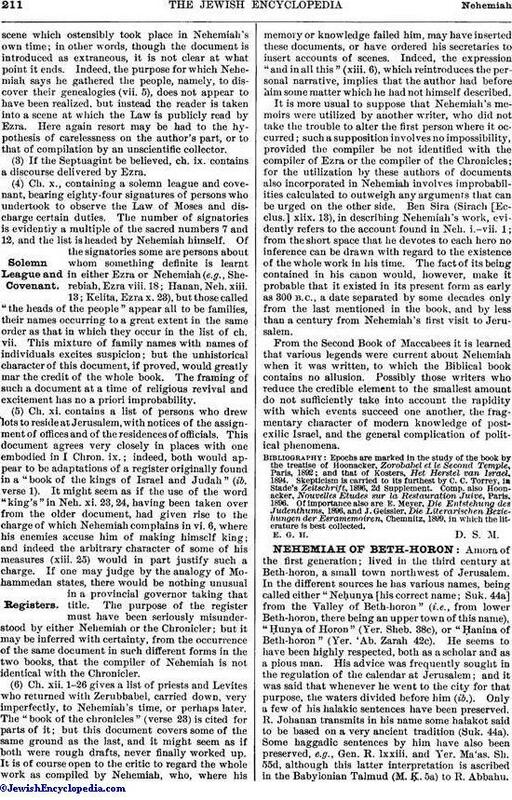 The fact of its being contained in his canon would, however, make it probable that it existed in its present form as early as 300 B.C., a date separated by some decades only from the last mentioned in the book, and by less than a century from Nehemiah's first visit to Jerusalem.From the Second Book of Maccabees it is learned that various legends were current about Nehemiah when it was written, to which the Biblical book contains no allusion. Possibly those writers who reduce the credible element to the smallest amount do not sufficiently take into account the rapidity with which events succeed one another, the fragmentary character of modern knowledge of postexilic Israel, and the general complication of political phenomena. and that of Kosters, Het Herstel van Israel, 1894. Skepticism is carried to its furthest by C. C. Torrey, in Stade's Zeitschrift, 1896, 2d Supplement. Comp. also Hoonacker, Nouvelles Etudes sur la Restauration Juive, Paris, 1896. Of importance also are E. Meyer, Die Entstehung des Judenthums, 1896, and J. Geissler, Die Literarischen Beziehungen der Esramemoiren, Chemnitz, 1899, in which the literature is best collected. E. G. H. D. S. M.